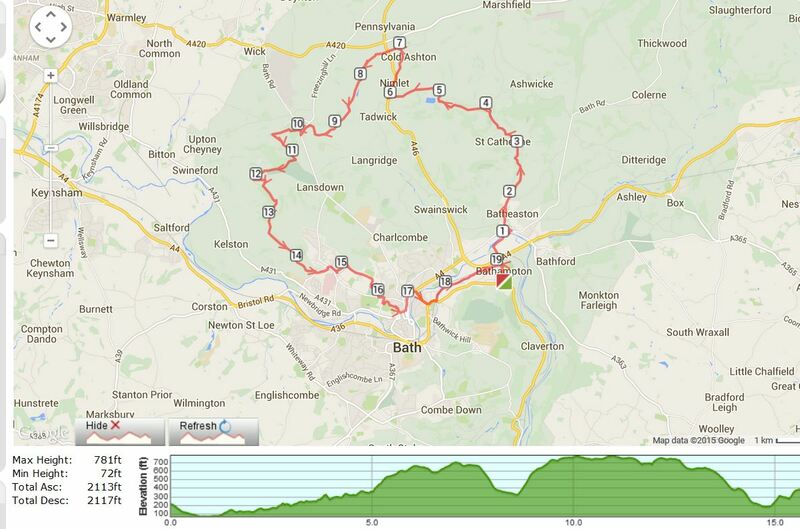 The 20 mile route that is one of my favourite training runs. With hindsight, having run my A race so early in the season it has been a summer where I have involuntarily felt disjointed from the ultra scene. When I actually think about this, that is just in my head. I think with all else that has been going on, particularly with a huge lifestyle and career change I have possibly talked myself out of ‘form’ when I actually realised this is not the case at all. I never go into a race conscious of not finishing it. I know that is always a risk and that is why the reward of finishing an ultra, in terms of personal satisfaction, is so high. But as I have started to get conscious of the Cotswold Way Century getting closer, I have already been softening myself up, that maybe I am not ready for a challenge of this nature right now. Maybe it’s OK to start and give it my best shot and if I drop, I drop. So, as I went for my longest run in a while yesterday, on one of my favourite routes around Bath and where my best time for the 20 hilly miles has topped out at around 3 hours 45 minutes, I said to myself that anything around 4 hours would be fine. I finished in 3:30 and I enjoyed every single step. It was one of those runs where everything, simply everything, felt right and it has firmly put my mindset back in the game for 5 weeks time. Three weeks of solid training and two of gentle tapering and I will be on the start line raring to go. Ironically, because my runs in London in the mornings before work have been shorter, I have made them fast and it is this speed which I realise made yesterday feel so easy. I may not currently be logging the miles or having the time on my feet that I would usually like, but the miles I am logging are hard earned and quality miles. This morning I also booked my flights to return to Brazos Bend in December to take on the 100 miler once again. This is a very personal and very poignant run for me and it is important I end my year back in Texas for this.